Be one of the very first to stay at Phuket Holiday Villa and receive complimentary airport transfers for all guests with a minimum 1 week stay. View our Reservations Page to check availability and book your stay. Phuket Holiday Villa - The perfect location to enjoy Phuket. CLICK. Set against the picturesque backdrop of ‘Big Buddha’ in Chalong Bay, this private tropical pool villa offers a truly relaxing holiday experience. Be pampered in your own private piece of paradise, away from the crowded beaches and hotels. At rates that compare to most hotels with facilities that many can only dream of. Complemented with traditional Thai hospitality and a Thai Manageress on call to make sure your holiday runs smoothly. Nestled in the newly developed Chalong Harbour Estate, this pool villa has been constructed and furnished using only the highest quality materials and furnishings. From the relaxation room overlooking the teak decked swimming pool through to the fully equipped Western kitchen, two king size beds with orthopaedic mattresses and ensuite bathrooms. The gated Estate offers 24hr guarded security for peace of mind with lush tropical parks and lagoons. While the villa offers complete comfort with air conditioning and ceiling fans in every room, jet propulsion salt water swimming pool, 40” LCD TV & Home Theatre (living room), 32” LCD TV & DVD player, PC with free WI-FI Broadband Internet (relaxation room), Chromotherapy Ozone Spa Bath & King size Beds. 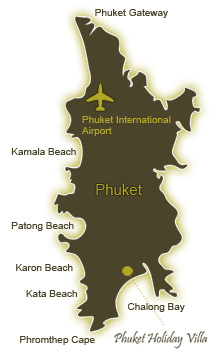 To view more information or book Phuket Holiday Villa please follow the links above. We hope to see you in ‘The Land of Smiles’. 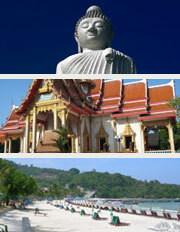 Phuket's attractions are some of the finest in Thailand. CLICK. Modern luxury - View full details about the villa, including facilities and pricing. CLICK. ©2010 Phuket Holiday Villa. All rights reserved.